If I hypothetically asked you to think of a person who was being ‘really emotional’ what kind of characteristics do you think of? Do you get a mental image of someone who is incredibly happy, immensely grateful, amused or inspired? Probably not… If you’re like most people, it’s the exact opposite spectrum of emotion that comes to mind. In our society today there tends to be an underlying assumption that emotions are negative, and more specifically that crying is weakness, and something that is meant to be hidden, controlled or suppressed. But really, tears hold a special kind of power to cleanse your mind, reconnect the head and heart and realign you with the power of your soul. And yet today, tears are commonly seen as a form of weakness, as being ‘childish’ or giving into negativity. Here is a slightly different perspective on crying. Crying is healthy… On both an emotional, spiritual, and physical level. The first time I really connected with the Archangels, and Jesus in the channeling space, I was so overwhelmed with the immense love of their presence, that although there was a message for me there, I couldn’t speak it. My vibration was too low, there was too much pain energy in my heart, and so while I knew there was a message to share, I opened my mouth to speak, and all that came out was tears. At the time, I was embarrassed and it felt like a failure… This wasn’t at home in a private place, I was in a class and there were about 12 people sitting there waiting to hear me channel, when instead I burst into tears. But looking back, the tears were beautiful, and they were exactly what I needed. Through my tears I received a powerful heart healing from the Divine, and a huge validation of the immensely beautiful energy of the angels and Jesus who I had connected with. I cried my eyes out and with those tears, I let go of so much of the pain I had been holding in my heart for years. After crying that day, I felt better. I felt lighter, and freer, like a weight had been released from my shoulders…. Scientific studies have validated this and shown that people do feel better after a good cry. Crying is a powerful way to let go of sadness and anger, past hurts, grief and wounds. When you cry, it’s your body’s natural response to whatever challenging emotion has appeared in your inner space. Think of each tear as a physical representation of sadness and stress that you’re now letting go of. 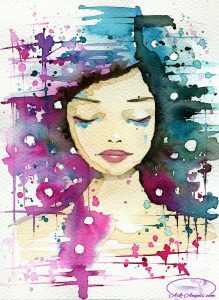 If you stop yourself from crying, and don’t use some other technique to release the sadness within it can and will build up to a point of depression, or overwhelm. So if you feel like crying… Let the tears flow. Have a good cry, experience this powerful form of release, and let it go. While you’re crying ask the angels to help you cleanse your energy and release whatever is weighing you down. Let go of whatever it is you’ve been holding onto thought he power of your tears, and then move forward. Refocus on what you want, refocus on love, on joy, on the positive you can now move into. If you feel like crying, don't suppress it… Let your tears flow so you can purify your mind, body, and emotions of stress and negativity… On the other side is a new level of peace, love, and light. Do you have an experience of healing through tears? I love hearing from you… If you'd like to share your story feel free to comment below. I have been going through a lot for the past four years. Lately i was having a hard time on my job after nineteen years. My lady boss literally said that she was going to break me. She did all kind of wrong things to me. One day a lady who was my teacher came to reorganize my department with my new coworker that i had a not so good pass with. After working with her, as she was pressuring me, she started yelling at me for no reason and making sure everyone hear her. That day i cried for hours. The next day i woke up fresh and renewed. And since then i look at life differently. Now i’m moving forward. l sm agree that releasing the feeling of grief, pain,depressions,through tears makes my soul in peace and like a magic a feelings of a great relief and peace. Thanks God, you alwsys with me and my angel guide on me..Oh its a great blessing,,thanks Melanie,, you open my eyes about tears,God bless you. God is there, and God is aware of our thoughts and feelings, what we go through, and our hardships also. The more we turn ourselves toward God and for God, the better life and things can become. That seems to be the way it’s worked all these years and decades! Also recited that all through out the Old Testament! Good day. I was feeling so dissapointed so lonely and I cried a lot because my soul and entire body was hurt. Now I know that this tears will bring more joy and a true love to my life. My Angels are healing me and protecting me always Thank you!!! Only the other day I felt the need to cry for ALL the tragedy in my life. From a very young age I had to be strong for myself and others and so it has gone on … I felt such relief and a knowing that it was the right thing to do and long overdue. Then, a disappointment of the heart came along out of the blue and I rationalized that it wasn’t major enough for tears BUT I couldn’t hold them back! That small still voice inside said, “Now you know this is OK … Big or small”. I felt instant relief! Yes, the tears can heal. Don’t let anyone have you fooled otherwise. I value the purification of my soul, after “living in the flesh” for quite a while, and repentance is a gateway of life for me, God is alive and true, and has called on me a long time, knowing that I would slowly but most certainly, turn myself over to God. All feelings or emotions released through crying have different tears. They study sad happy angry love joy…. each tear had a different make up. It is true crying is releasing emotions. It is not a sign of weakness. Actually when you work through the emotion right away there is no need to surpress feelings. I am very sensitive and I will cry for a variety of reasons. I am grateful I am hurt I am humbled. I am feeling joy. I am overwhelmed. I am angry. Its all good. I love this article. Because I, too, believe in tears.The last time I had a good tender cleansing cry, I felt a release in my root chakra 🙂 الحمد لله: Thank God. Sometimes, though, I feel a restriction. Do you have advice on how to open up and let the emotions release? Thanks. “Crying” reveals the depth of our soul, and our soul’s capability of Loving….. this is the ONLY reason for tears… they teach about our soul, and how deeply we love……. Sadly we live in a world that denies and discards tears, saying they are “weak”. this could not be further from the truth. Our Soul IS our feelings….. and when we cry, we learn How deeply we can Love…. this Self awareness is infinitely more valuable than all the riches of earth and heaven. Tears transmute our pain or grief instantly at the moment they are felt and allowed to be expressed…… Watch the frost in Winter, and how Her magical dew touches the grass and fields…. is not this winter frost dew simply our tears revealing our deepest winter feelings and allowing them to thaw and be released….. RESPECT feelings for the magical wealth they reveal about our Selves…… and listen NOT to the male dominating patriarchal view on this planet that “control” of emotions is the way to be. NOW DESTRUCTIVE is man and his ignorance of the world of feelings….. he will continue to destroy himself unless and ONLY when he acknowledges the world of feelings….. then maybe this precious earth will finally heal, and man will become extinct instead of the animals he abuses….. !!!!!!!!!!!!!!!! Only a REAL man would grow up enough to realize that fairly often, he MUST allow himself to release some tears. “Big Men Do Cry”. No, maybe not over a lost penny, but over things and situations in which they had denied and buried their own inner feelings and emotions. I find that a good cry helps me release and move forward with my life. The angles help you to focus re energize and wipe away fears frustrations and pain.